Atomic batteries to power...turbines to speed. 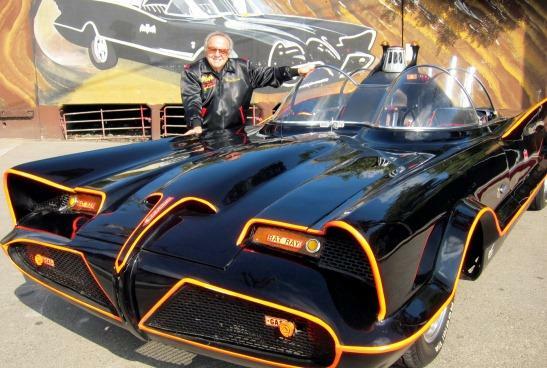 My ultimate toy, the Batmobile, is going up for auction. Batman and Robin's ride from the 1966 TV series starring Adam West and Burt Ward is being sold on January 19. The 1955 Lincoln Futura that legendary custom car designer George pimped out is one of the most recognizable cars in the world. Barris originally bought the famous two seater for $1 from Ford and spent $15,000 to turn it into the iconic Bat-vehicle. Barris, who is 87, says, "I thought about it and decided it should be shared with people around the world, not sitting in my showroom in North Hollywood." Barrett-Jackson, the Arizona auctionhouse, believes the car will go for millions, which is a little to rich for my blood, but I might just have to pick up a replica for the less expensive price of $150,000. The original Barris version of the Batmobile comes with its original V-8 engine, hydro-automatic transmission and an array of bat-gadgets, which include the Bat Ray projector, Emergency Bat Turn Lever, and two rear-mounted parachutes. What does everyone think about pooling together and buying this piece of TV history? Ah i wish i could own this! I have this awesome ideal of driving thought McDonalds dressed as Batman and my buddy Scott dressed as Robin in it which i think would be funny to see the folks faces inside if i did. Also imagine taking it to one of those student school money rising hand car washes too much fun. That's awesome JBoy. If I ever get one, I'll pick you up we'll drive around town. All I need are those Powerball numbers! You and me both. I'd buy all the versions and build a Batcave to park them in if I won. Awhile ago I saw advertising for a kit car Batmobile that looked pretty great on the road. Next to the car from Goldfinger it's the coolest car you can have. You said it Cal. I need to find a way to get one. We can do this. If each of our followers donate $500 we can at least buy a replica. If I only pitch in $1 can I still drive it sometimes?